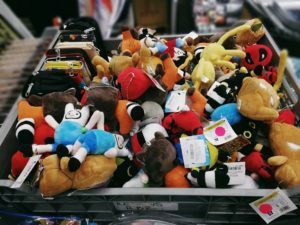 The Electronic and Gaming Expo 2018 was saturated in fandom, passion, and enjoyment. With pick-up esports matches, exhibitions from PC- and board game suppliers alike, cosplayers, contests, and an impressive artists’ alley, there was something for attendees from all sorts of fandoms. 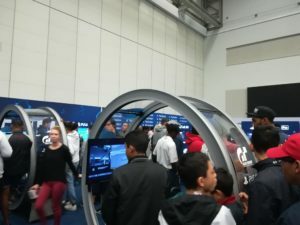 Encouraging the aspirations of even the youngest electronics and gaming enthusiasts in Cape Town, the expo offered a highly discounted entry fee on Friday for scholars wearing their school uniforms. Parents waiting for their kids could be seen changing from patient sentinels, watching the delight of their little ones, to equally enthused participants as something caught their interest. Spot the Deadpool plushie. Image courtesy of Sesanē Sealy. While slightly smaller than last year’s expo, organisers did not leave EGE fans disappointed. It’s not surprising that EGE attracted some big names to join the exhibitors list this year. The expo attracts electronics and gaming nuts from across the country and this year’s more well-known suppliers did not hold back. When it came to tech, Computer Mania and Playstation spoilt expo-goers with a host of devices, rigs, and games to test. Computer Mania’s quadrant of the exhibitors’ area invited attendees to demo an extensive range of computers, peripherals, and super-machines. Their exhibit, from my own experience, and from what I saw in my fellow computer geeks, was successful in whetting the appetite of PC users of all ages and tastes. Absolutely dominating the bottom left portion of the exhibition venue, PlayStation really pulled out all the stops for their display of the sheer magnitude of possibilities in console gaming. The PlayStation gaming rigs, and demo stations, were a hive of activity and enjoyment during almost every single hour of the expo. 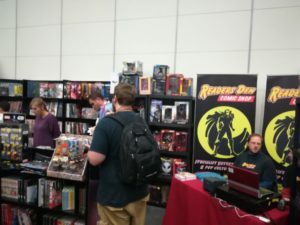 For those whose interest didn’t lie in gaming and tech, both Reader’s Den and Battle Bunker offered browsing opportunities that had attendees enthralled. Flanking the Battle Bunker exhibit, board- and tabletop game lovers were offered a space to delve into their purchases with their fellow fanatics. Groups were huddled together over good, old favourites, and some newer titles – many freshly unboxed and others weathered by hours of fun. Gaming stages hosted by ZA Gaming Alliance and African Cyber Gaming League monopolised the expo’s live entertainment offering. The stages held matches for professional and pick-up teams for a range of games – including MOBAs, shooters, battle royales, and more. The MCs and audience kept a gaming buzz going that resonated throughout the venue from Friday to Sunday. Along with pick-up matches, the gaming stages offered audience members a chance to win prizes for all types of participation – from impressions of video game characters, to planking, the gaming stages were a lively source of laughs, cheers, and entertainment. 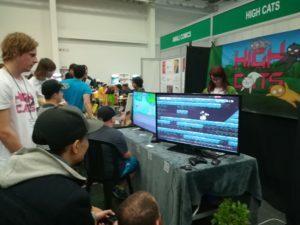 Indie game developers Indie Glue, offered expo-goers the opportunity to try their game High Cats which was released on Steam on the first day of EGE. The game is a co-op platformer that is heavily reliant on teamwork and persistence. Players play as cats, who, after delving into the catnip jar, attempt to catch a teleporting tin of tuna. The game was enjoyed by players of all ages and skill levels. I especially enjoyed watching the fervor and confidence of a girl, who couldn’t have been older than about twelve, trying to raise the spirits of her teammates. If players could get to level nine then Indie Glue rewarded them by putting their names into the game’s credits and giving them a free copy of the game. The prestige attracted many groups and individuals. It was inspiring to see strangers work, reason, and play together to make their mark on the game. EGE even offered aspiring game designers and developers some time to explore their interests with exhibitors like Friends of Design, AFDA, the SAE Institute, and The Animation School. They provided a platform for those involved in and passionate about the digital arts to discuss opportunities for study and collaboration, and served as a central source of information on the industry as a career prospect. For the lovers of art, nerdy goods, and wardrobe accessories that are synonymous with expos and events like these, the artists’ alley at EGE 2018 catered for a host of fandoms, interests, and tastes. Expo-goers could admire and purchase prints and paraphernalia from local artists such as Artofscs and Awali Comics. Those wandering down the artists’ alley were wonderstruck by the magnitude of options, and the dazzling quality of jewelry, clothing, and accessories. Crafted goodies and souvenirs could be purchased from the likes of Druid’s Arts and Crafts, Missy Mad Hatter, Drakancraft Studio, and many other fabricators, artists, creatives, designers, and manufacturers. The cosplay scene at EGE 2018 was lively as ever and characters from a wide range of games, anime and manga, movies, and comics could be found on and off the cosplay stage. Cosplayers took part in a cosplay masquerade on every day of the expo, and spectators were equally enthralled and entertained by the skill,artistry, and amazing portrayal of character this year’s cosplayers brought to the stage. EGE also hosted cosplay competitions: a free for all competition as well as a construction competition on Saturday and Sunday. EGE cosplay. Image courtesy of Sesanē Sealy. To further bolster support and interest in the cosplay scene, the cosplay stage also held a number of talks by professional local cosplayers. 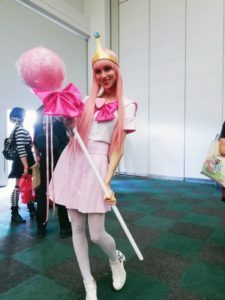 I attended a talk by Yamaki and FrostyKitty Cosplay on crossplay – cosplaying as a character that is a different gender to your own – and the pair shared some superb tips, tricks, and advice for successfully bringing characters to life. The Electronic and Gaming Expo this year seemed to leave nerds, geeks, gamers, scholars, parents, creatives, cosplayers and everyone else in between entertained and earned its title as a good ‘n proper nerd-fest. 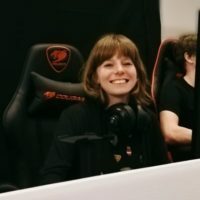 Bronté “Romanov” Miles is a bit of a late bloomer in gaming terms, but more than makes up for it with enthusiasm, a deft hand on the WASD keys, blood, sweat, tears, and a touch of salt.